About meAfter pursuing parallel careers in writing and in industry, I finally settled on being a full-time writer. I'm a Dubliner, exiled in Cork for over twenty years, and counting . 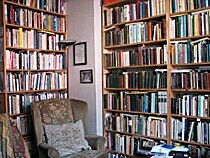 . .
About my libraryOver forty years of accumulation, both random and deliberate. A great deal of poetry (avant-garde, traditional, translated), fiction, history, reference, philosophy, theory, and much else. Somewhere in excess of 12,000 volumes, I reckon. This may take some time, particularly as many of them are old, and will have to be entered manually.